Business first - Here is the link for the handout I gave at the retreat last week. It is a PDF attachment on my google site that you can print off on your computer. I was going to email it but it seems easier to make it available to anyone since I had a few requests. I'll put the link on my side bar, too. It is for personal use only. Thanks! At the retreat there was a vendor area and we had plenty of time to look at fabric and supplies. I was being very careful with expenditures or I would have found lots to bring home. Lynette, a sweet girl from my "Leafy Treetop" class has opened a brand new shop just north of St. George, Utah in the little town of Hurricane. 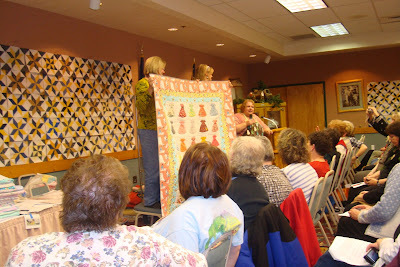 It is called Main Street Quilt Cottage. Lynette and her crew gave all the retreat participants "SWAG" in the form of a red pen and home made lip balm. I think of Lynette every time I use them. Her shop in Hurricane is about 5 hours south of where I live so I haven't visited yet, but I'd like go soon. 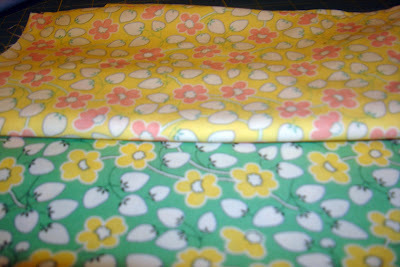 I did buy a few little fat quarters from Lynette's shop. 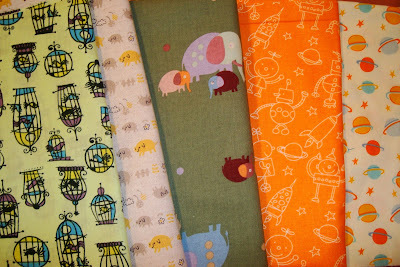 I do like me some Sunbonnet Sue (Flora avert your eyes) and there were 3 prints in sweet colorways that I brought home with me. 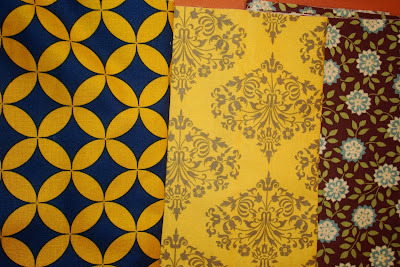 They are on my cutting table where I can admire them a few more days before placing them in their new home on my shelf. 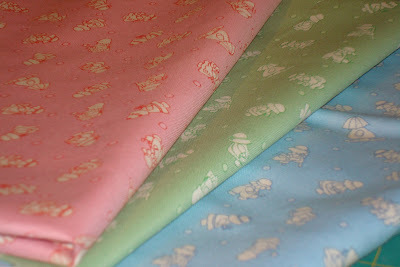 I love strawberries too, and these two little fat quarters were in lovely colors so they joined the Sues. And then 2 sweet novelties called me from among the colored jewels of rolled-up fat quarters. So 7 fat quarters found a new home and they were on sale. Deal. Wasn't I very good? 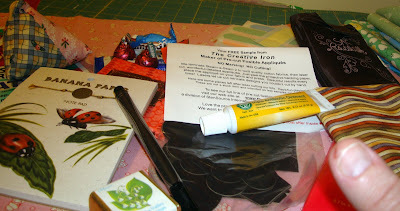 One more thing I bought from Lynette's mini shop at the retreat was this little teeny tiny iron. It is perfect to tuck into my travel sewing kit. 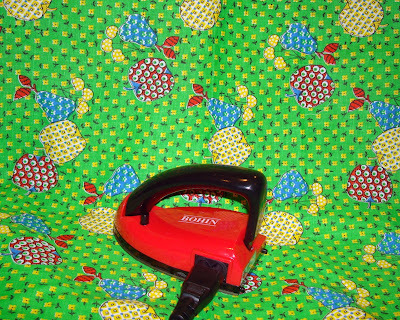 Plus it is red and very vintage looking. It works pretty well, too. 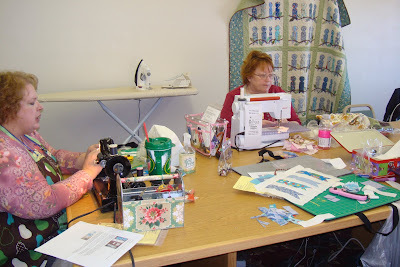 One of the classes I taught with Shelbie was the pincushion class mentioned previously. I didn't show you a close up of the finished pincushion that Shelbie made during the class. I've been saying orange is the new red. And this proves it. 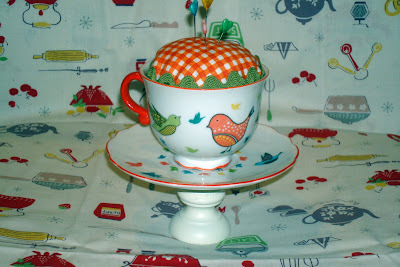 After Christmas I purchased this teacup from Anthropologie on sale for $4.00. The pedestal is a little tiny candlestick holder I got at Broadbent's for 88 cents. It was stained a redish wood color. Mr. Hive sanded it and spray painted it a warm white. We used this glue that you can buy at any craft store. The glue holds really well but is stinky. Be warned. 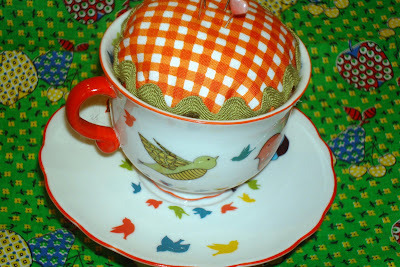 The pincushion turned out so incredibly cute. Remember I got this idea from Pam eons ago. When I got home I had this wonderful surprise waiting for me. Monica - is there anyone more sweet or thoughtful than her? 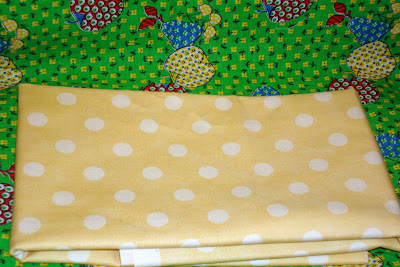 - sent me this yellow Moda "Dottie" that I had been admiring on her blog (see this post). It is the perfect buttery color for one of the tea kettles I'm appliqueing. I gushed over it and she sent some to me. Blush. Thank you so much Monica. She called it a "random act of stashiness" and it isn't the first stashy surprise Monica has given me. (It will be fun getting her back at a random time! 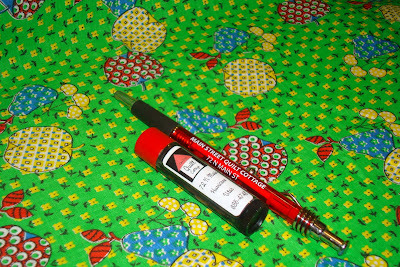 shh) Check out this month's Quilts and More for Monica's stuffed mushroom needle book pattern. I feel privileged to count someone talented like her as my friend. Monica is a star. She's going to be featured (face time and all) in 2009 Studios magazine. Wowie. Edit - It is pretty obvious this was my first slide show as there are a few pictures on a couple times and others didn't make it. I'll do better next time I think. It was working earlier but now not, so I had to reload it and delete the slide show from this original post. 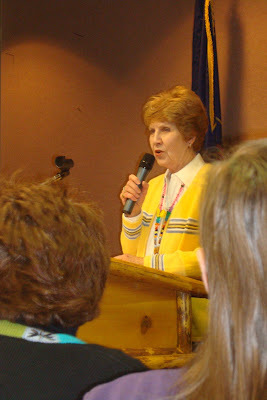 Carment Geddes was our gues speaker and she did a wonderful job. We all enjoyed seeing her work. Our show-n-tell was outstanding, as always. Back to our regularly scheduled program tomorrow without technical difficulties. So if you are sick of me bragging about how much fun I had last week, skip to the next blog. Because I am not done yet. 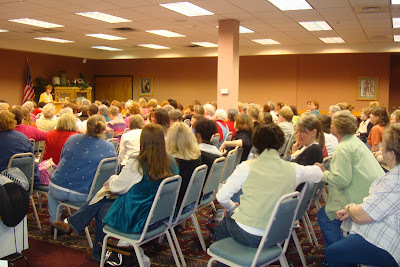 Everyday at 1:00 at 7:00 we had general meetings at the retreat where prizes were given. My kids call it SWAG and told me it means "stuff we all get". Well not everyone is fortunate enough to win a prize so I'm not sure it was SWAG but it was very fun seeing the winners jump in excitement. I did manage to snag a prize the very last day at the very last general meeting. 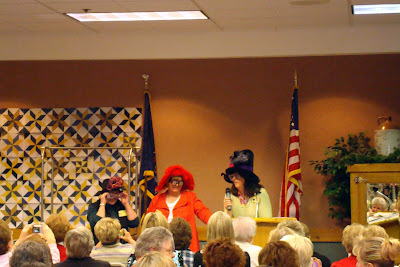 The fun door prizes were drawn out of a bag by 3 sisters Tauna Larsen, Janene Tullis and Sheree Walstad. The girls were hilarious. Everyday they wore hats and told silly stories with hillbilly accents. Janene is in our local quilt group. And she is the one that gave all our local gals that fabulous lap board prize last month. I'm loving that every time I use it. The last day Tauna told a story about her needing stitches from a nasty quilting gash she got at the retreat a previous year. 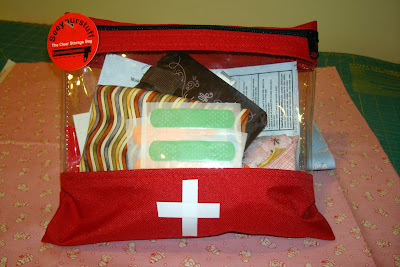 So she kindly put together this 'first aid for quilters' bag to give away as a door prize. She asked if there was anyone that cut themselves during the time together. My fabulous friend Flora immediately pulled my hand up and declared me the winner. There was some vying for the prize and many declaring injuries but thanks to Flora I got it! Don't you love it when you win. Being the last day even made it sweeter. Though my cut wasn't big, it was on my right thumb, an essential part of hand work. And wouldn't you know it, Monday morning after the retreat I cut the tip of my other thumb when I was opening a package at work. So I've got band aids on both thumbs. But let me tell you it was worth it to win Tauna's prize. And by Sunday putting on the ointment and band aid made a huge difference in my right thumb. So Thank you Tauna! Friday night was my trunk show. I'll spare you most of the pics of me and my quilts. Most of you have seen a good part of my quilts here before. I was nervous but soon relaxed in front of all the lovely ladies. 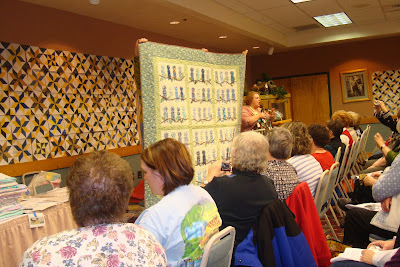 The funnest part of showing my "Leafy Treetops" quilt (above) was when all the ladies broke out in song singing "In the Leafy Treetops, the birds sing good morning . . . ". 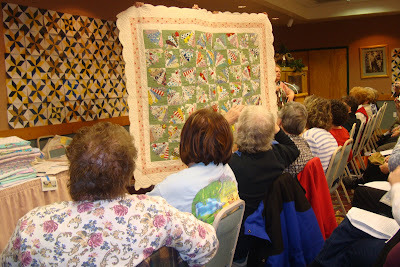 It was spontaneous and wonderful to connect with all of them singing a song from childhood that inspired the quilt. 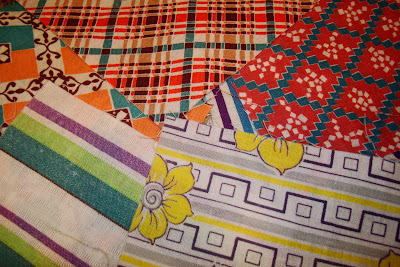 I gave everyone a hand out on finding vintage or unusual reproduction fabric, my fabric/quilt point of view, and a little SWAG of a 6" feed sack square. I could go on and on and on but I know you have a life so I'll stop right here. If anyone wants a copy of my handout, just email me and I'll pass it along. Not that it is fabulous or anything, but ya know, some one might be interested. One more post Friday show my few buys at the vendors tables. I only picked up a little bit but I want to sh0w-n-tell. 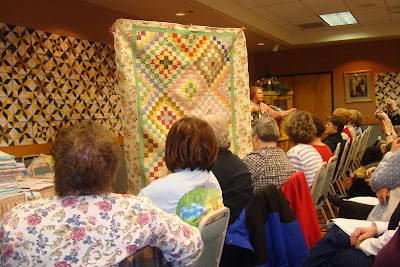 Tomorrow I'm going to try to put together a slide show from our Alpine quilt group last night. It was fabulous! My schedule at the Ruby's retreat was brisk but enjoyable. 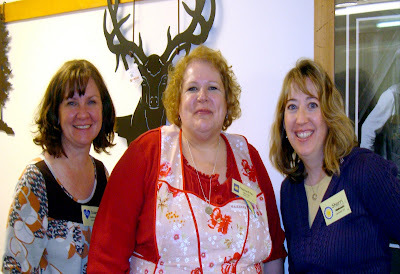 I took 2 classes from talented teachers and I taught 3 classes and gave the Friday night trunk show. Time flew by as with all fun things. The first class I took at Ruby's was from Carol Johnson called Parker Homestead. It's a picture art type 8" x 11" mini quilt of Butch Cassidy's father's homestead in Circleville, Utah. I'm not usually drawn to landscape quilting but the charm of this white cabin drew me to the picture. I've always wanted to know how they do these art quilts and so I decided to take a class about a subject totally unknown to me. It was fun learning the layered fabric techniques and Carol is a great teacher. As you can see I'm not finished yet. The actual house is an applique on top of the landscape formed by different fabrics and textures. 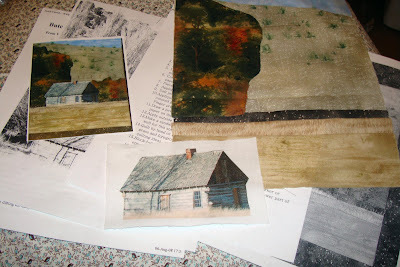 Carol printed the houses from her computer onto fabric from a photo she actually took herself. I enjoyed the class and everyone else did too. The other class I took was from Nedra on Saturday morning. She taught a traditional paper template hexagon class. 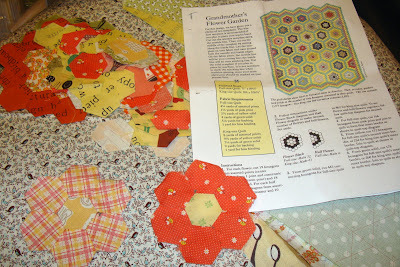 Since I've been working on my Inklingo hexagons I decided to bring them to class and work on them while watching Nedra's technique and getting to learn more about hexagon quilts. Nedra is so composed and classy. It is hard to describe her but those of you that read her blog know what a wonderful talented lady she is. 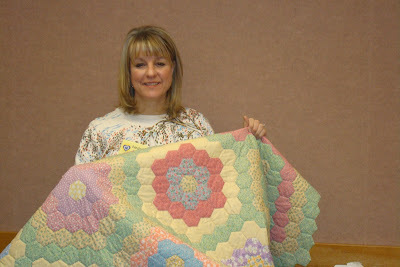 Here she is with her beautiful hexagon quilt. Can you believe she made this while being a mom, wife and student? Incredible. 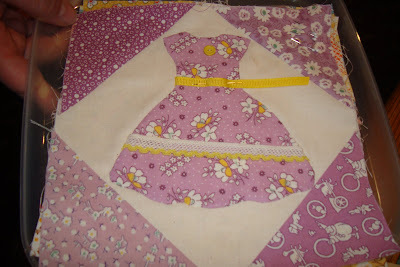 The first class I taught was "All Dressed Up" - my dress quilt pattern. 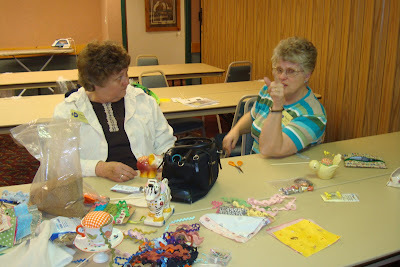 I had kits prepared so we could get straight to applique. 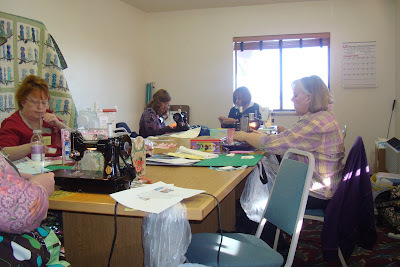 I was surprised that none of the girls in the class had experienced the applique technique I taught with freezer paper. I sort of explain how to do it here. I do not use starch and iron the seam allowance around the freezer paper. I've tried that and only succeeded in burning my fingers. I do it sort of like this tutorial but I've never used plastic over top to make placement. To my delight I think they all enjoyed learning this technique. 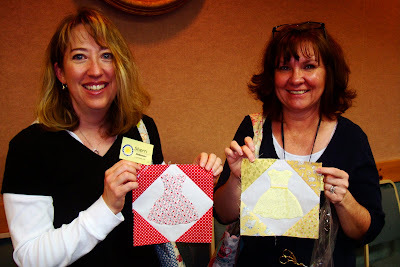 My star pupils Sherri and Dawn show their first blocks. Cute, huh. Oh we had fun. 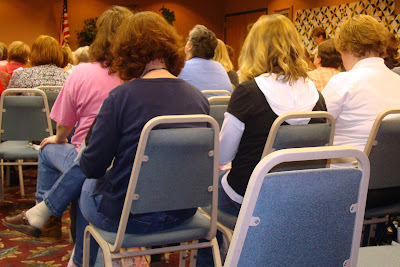 Later in the day is a back view of Dawn and Sherri during one of the group meetings. 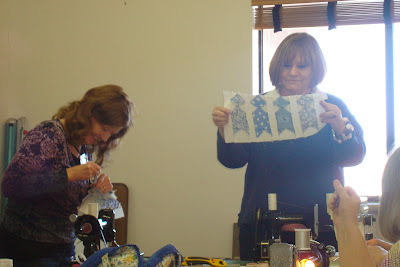 You can see their bent heads working on their applique while they listened to the presentation. I was so proud of them working on their blocks whenever they had a chance. Here are Kayrene's blocks. I was so proud of her, too. Even though applique was not her favorite part, she loved embellishing the dresses. It is my favorite part, too. That girl is going to finish this quilt quickly. She's determined. I love that. I taught my "In the Leafy Treetops" quilt. 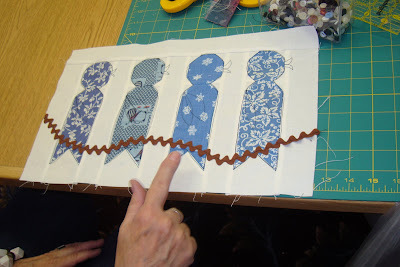 The girls taking this class caught on really quickly and although the block construction is simple, the sketch machine embroidery is new to most quilters. Shauna and Tonya had been hard at work on their feather weight machines making blocks. The "purple loving Lynette" is on the right here. I spoke to her on the phone before the retreat. She owns a great quilt shop in Hurricane, Utah called Main Street Quilts. I can't wait to visit her at her new shop when I go down south to visit Nedra. Lynette is the type of person that is an instant friend as soon as you meet her. 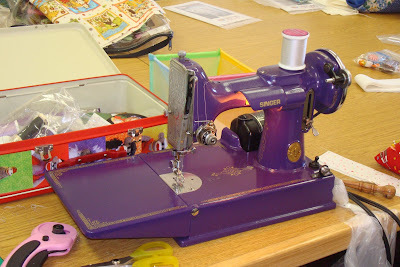 I was surprised at how many quilters had featherweight machines. Lynette even painted her's purple. How about that Terri! 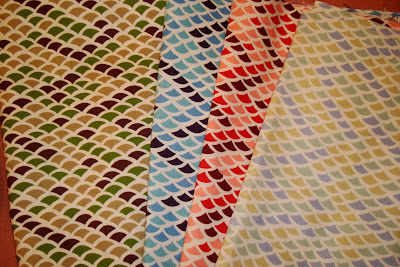 Tonya had her first row of birds all sketch embroidered. It was great to see the classes progress. I can't wait to see pictures of their quilts and I hope they send them to me. Across the table is fun Valerie. 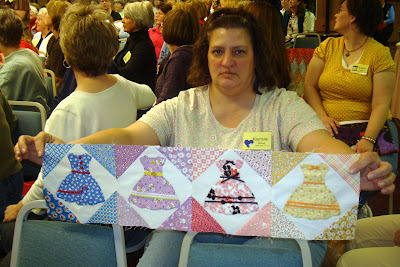 She is a quilt designer and has a blog and website. Go see her pink birdies at her blog. They are darling! Missing from the class picture is Carol. She was so fun to have in the class. I really liked getting to know her. This smaller class was more intimate and we got to know things about each other. You can see me with my featherweight. And my soda Mr. Hive brought to revive me. 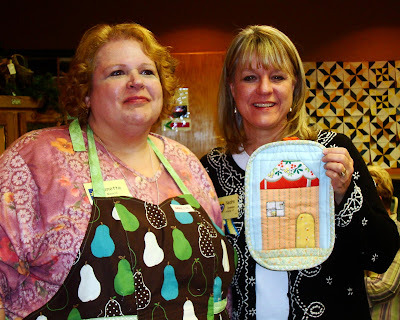 Shelbie and I taught a night class together for vintage pincushions. It was fun but somewhat challenging to get some of the round cushions into square openings. Valeen was such a good sport and had such a fun laugh. 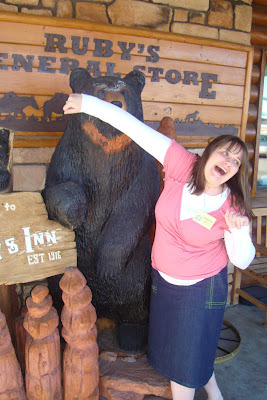 Her little bear was especially challenging. But oh so cute. We laughed a lot during this class. And found we had lots of connections. 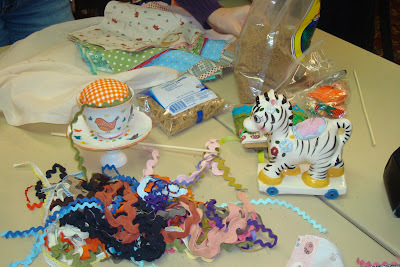 This was a more free form style craft with plenty of getting-to-know-you time. I had such fun gals with me there. 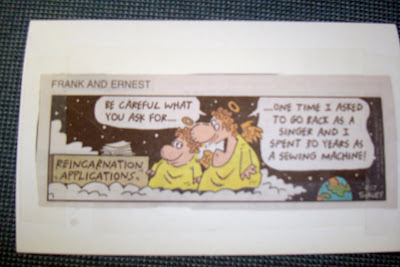 I thought every pincushion turned out just darling. Tomorrow I'll talk about the trunk show. Yeah I know it is a little self serving but I won't make you wade through every photo. I promise. It makes me smile just to review these pictures. I sure wish Bonnie would do a retreat for bloggers to get together. I know it would be a success. Bonnie is a master planner. If anyone could pull it off, Bonnie could. The title to this post says it all in a nutshell. I had a really great time at the winter retreat last week. Well, that is an understatement. I had an amazing time. 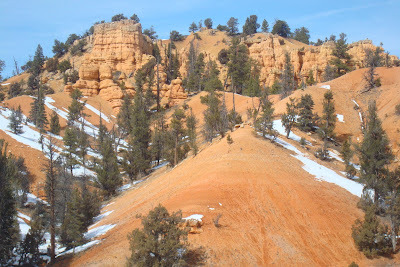 We went to Bryce Canyon, Utah - breathtaking. This was taken with our camera. It is not a postcard. Seriously. 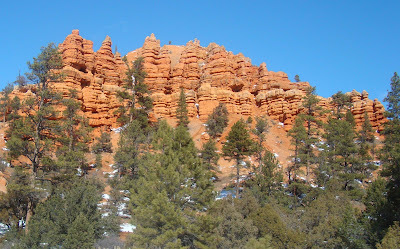 Bryce is in the southern end of Utah about a 4 1/2 hour drive from my house. Another picture we took. The rocks are simply amazing. If you ever, EVER, get a chance to vacation at Bryce Canyon - jump at the chance. I simply can't describe how beautiful it is and how many activities there are for all seasons. 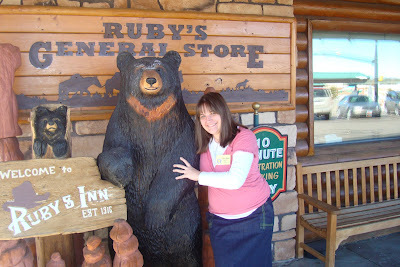 We stayed at Ruby's Inn. It is a family owned hotel and the accommodations were wonderful. My daughter Shelbie was my roommate and essential partner. I couldn't have done it without her. At the last moment I drug my husband along too. (Well, I didn't really "drug" him but he had fun, too. Really!) He was part time photographer, quilt toter, support and companion. I taught 3 classes, took 2 classes, and did a trunk show and small presentation on fabric from my point of view Friday night. Beware of the bears at Bryce, however. This one looks a little wooden but it got hold of Shelbie and wouldn't let go! 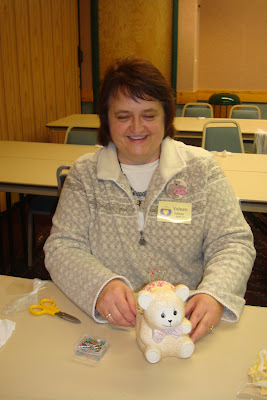 Some of my friends from our Alpine quilt group were there but I also had the sweet experience of seeing Nedra again. I can't say enough about Nedra and how much fun it was to be with her, Judi, Ricci and the gals. I took a class on Saturday morning from Nedra. 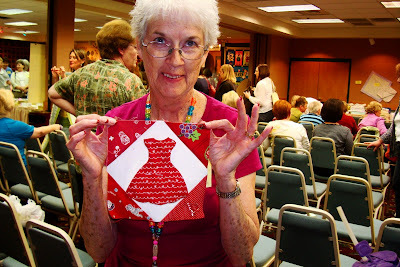 Here she is holding the potholder I brought for her. We are planning a weekend in her neck of the woods ASAP. Go visit her blog and see her pictures and her view from the Cactus Needle. She's an amazing person to be around. Here is a view of part of the crowd from the back/side of the conference room. 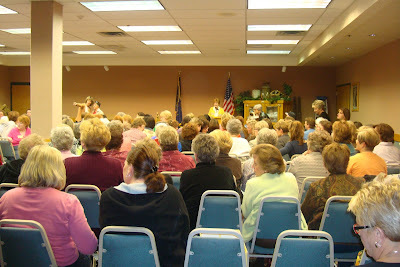 We met all together for noon and evening events - more about that in my next post. The fabulous Bonnie Miles put the whole event together and has been doing this particular retreat for 17 years! I don't know how she does it. From my vantage point it couldn't have been better. Bonnie - thank you so much for letting me be a part of the Bryce retreat. Isn't this cartoon funny? It was passed around last week. I really wish you could all have been there. My favorite part, of course, was meeting and being with all the talented and wonderful women. I think I talked to the majority of them at some point or other during the week. I thank all of them for making my stay in Bryce so memorable. More tomorrow! It is nice to be home though. I'll be spending a lot of time catching up with my family, home, and all of you. I'll be around to see what some of you are up to. Do you understand how when you abstain from something for a really long time that when you finally get to have it again there is a primal need to go totallly CRAZY OVERBOARD? 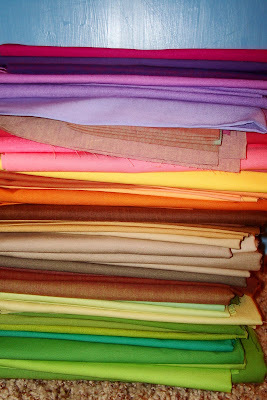 Well I have been avoiding purchasing fabric for a while. I've been trying to save money and I've been really good. But a girl can only go so long.... I had a few gift cards and I needed some motivation to work on my quilts so I just went nuts. 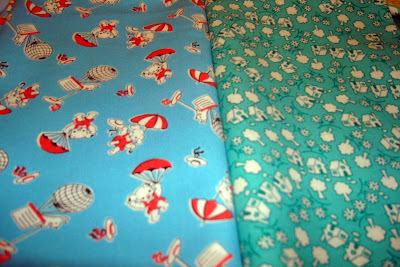 I am really growing my novelty fabrics as you can see above. I have a dream that someday I will have a little boy and he will love science and I will make him a robot quilt. 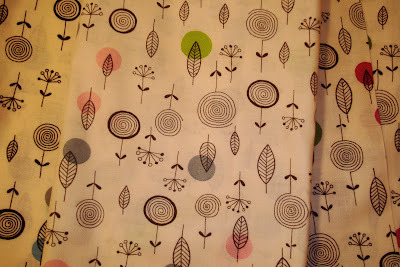 I am thinking of using this (above) as the back for my cactus quilt. These are just some lovelies I picked up. They will make nice cactus, cactuses, cacti.... what is the plural of cactus anyway? I bought this one in three colorways. It was more than excessive. 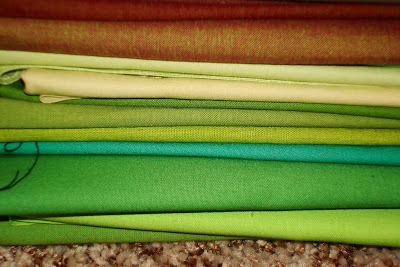 Here again is my stack of solids. I promise you that is about a foot and a half tall sitting on my bedroom floor. Well, almost. It was going to be more glorious when I showed the the color groups as individual pictures and then the whole grand stack as another picture. I think I accidentally deleted them when I tried to move them around, which I apparently don't know how to do. I need my mom back from her retreat. 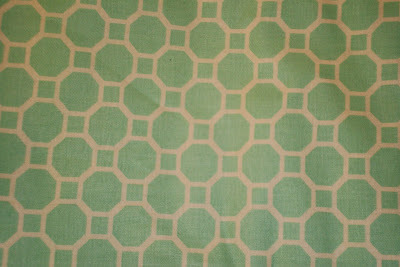 This is another fabric I bought in four colorways except I don't regret the excess one bit. I love them! Especially the green. This is kind of a secret. I raided my mom's antique and vintage fabrics while I was helping her get ready for her retreat (and a little bit while she's been gone, sshhhhhhh). I kept shoving little squares in my pocket when she wasn't looking. Except sometimes she was looking. Don't you think these will make nice cactus too? Oh good, I'm glad you all agree with me. My Sneak Peek so far . . .